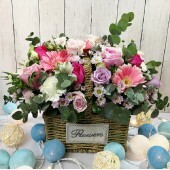 Our flower shop have many types of flower arrangement for the congratulations purposes such as new shop opening, moving to the new office, company anniversary, concert etc. 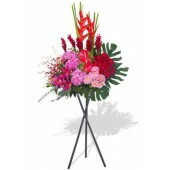 Many variety of seasonal flower will use in the arrangement to looks colorful and professional. Some of the arrangement will come with the stand, and some for the table arrangement. 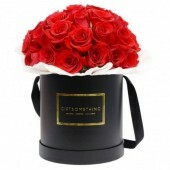 of arrangement can suit for different event. One Dozen Pink Rose with Eight Mix Color of Tulips in a Round Shape Gift Box ..
20 Stems Red Roses in a Round Gift Box The more the merrier! Having many fully-bloomed, mesmeric ..
A seasonal mixed flowers basket with roses, gerberas and greenly, smile enough for someone you.. 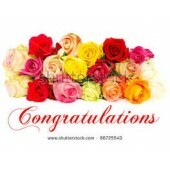 Flower arrangement for Congratulations, office Removal, Exhibition, Concert, Shop Opening, Office Op.. Flowers congratulation for Grand opening, office removal flowers, New shop opening and all others pu..
Congratulations flowers for shop opening, office removal and all kind of congratulations ..
Orange and Yellow Grand Opening Stand .. Tall Table flowers arrangement for shop opening, Exhibition or any ceremony ..
Red Grand Opening Grand ..
Red and White Grand Opening Stand ..